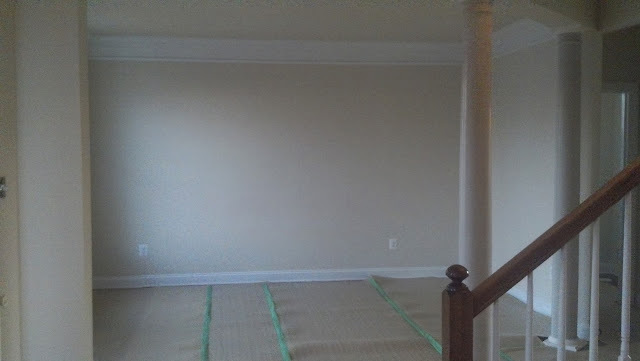 Here's what the room looked like before with our big blank wall. Progress picture- this image shows when we put the cabinet bases down. Steve made all the cabinet bases and he had to do some wiring for the sconces. We also had to take down the crown molding and baseboard trim to make room for the built-ins. The five bookshelves ready for their backs to be put on. 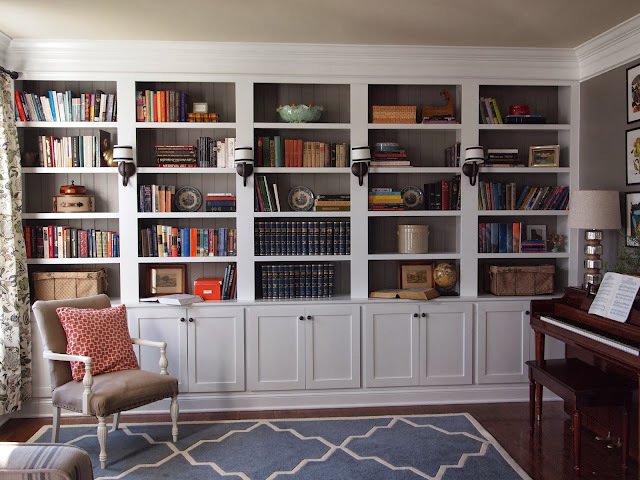 Steve and I worked together to make these bookshelves and we love how they turned out. 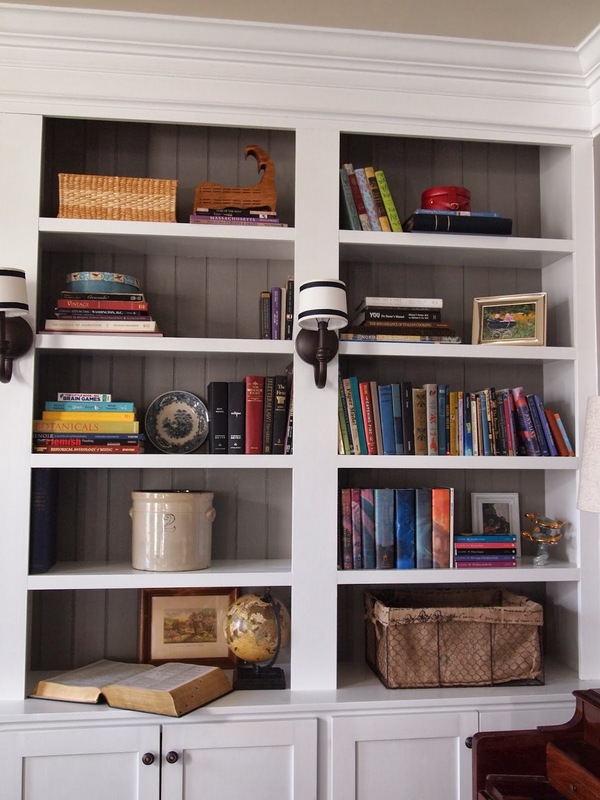 After looking at a bunch of different bookshelf ideas, we decided to paint them white. The wall color is Dovetail by Shermin Williams and the white is white trim paint (we just matched the paint with the trim). Have any of you ever built something that you feel so proud of at the end of a big project? I would love to hear about it. 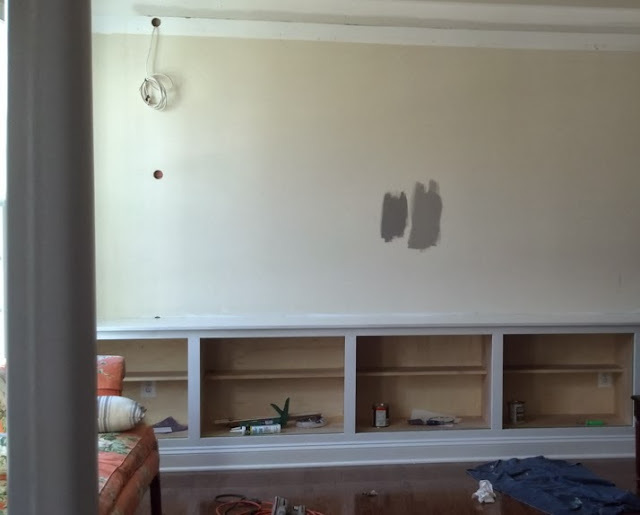 I'll get down to the nitty-gritty tomorrow for some details on how we made our built-ins. This is phenomenal! 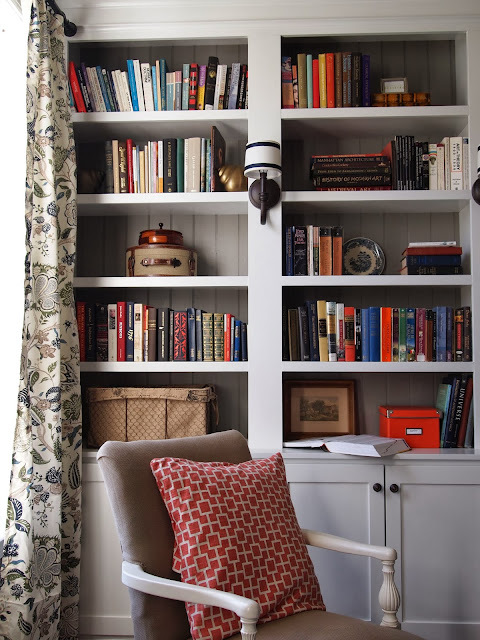 I love the lamps in between shelves. Well done! How long did it take you to finish the project? They turned out amazing. What a tremendous job you both did. Thank you! This project probably took about two months since we worked on it usually in the evenings and had to wait for the lights to come in. It did take awhile, but it was worth it! Wow- beautiful job. I loved the finished look of white and the base cabinets. 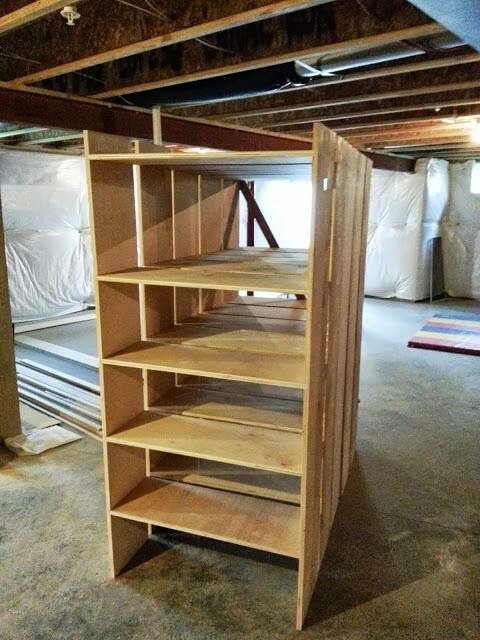 Are there any tips you and Steve could share in making the shelves? In what order did you put the back of the shelves on? Did you put them onto the wall, or onto the back of the shelves? I'm assuming that these shelves are built-in and not removable right? I'm trying to look at the shelves a little more in detail- did Steve put the crown molding in the front of the shelving or the back? Great job. the styling, the craftsmanship, the color choices, the details... it's flawless! This is magazine worthy. Tell Steve to build me one too! The bookshelves turned out amazing! This is exactly what I would love to have in my dream library someday. Great job! Great job Tracy! It really does look like something out of a magazine! I am hoping to inspire Joel to do something similar at our house! This is nothing short of inspiring. Absolutely beautiful. Thanks Rachel! Hope your family is well. I just discovered this project (and your blog) via Rene at Cottage and Vine and wanted to see all the gorgeous details. 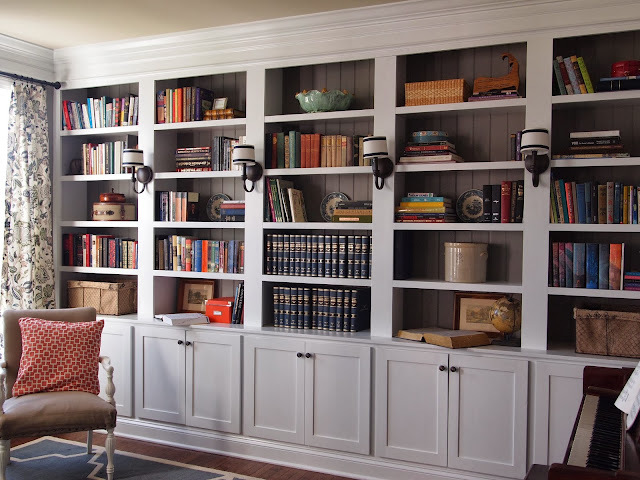 Love the sconces and the fact that you painted the back of the built-ins. Just lovely! Thanks Ashley! More projects to come on my blog so come back to see more. Thank you for your comment. Okay send you husband right over here, I have a few jobs for him!!! You both did an amazing job, love the choice of bead board and gray tone too! Thank you Karolyn! Glad you stopped by and could see our bookshelves. We have more projects coming up so please check back. So happy to find your blog through Cottage and Vine. The built in bookshelves are beyond wonderful! Can't wait to explore your blog archives. Love the post on styling the shelves. Thank you Peggy for your comment! I'm new a new blogger so there will be many more projects coming on this blog. Thanks Brooke for your comment! Your blog is great too! Oh my gosh - these are perfect and exactly what I am wanting. 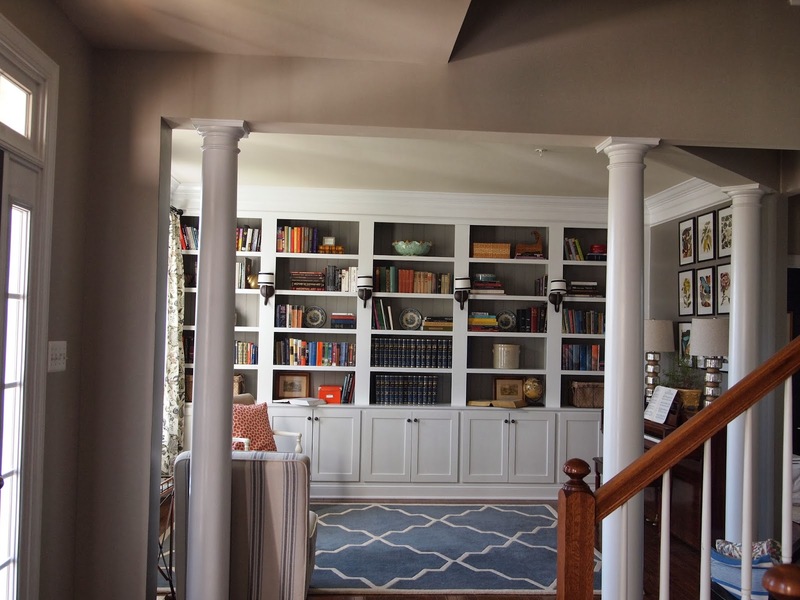 We want to turn formal dining room (we never use) into a library. I can't wait to read more about how ya'll made them. I just found your blog from Pam @ Simple Details ( I love everything she does). Look forward to your future blogs. Many thanks for sharing.